If you’re going Northbound but not too far enough from the city, you can head to Danao City, then Sogod, Cebu. 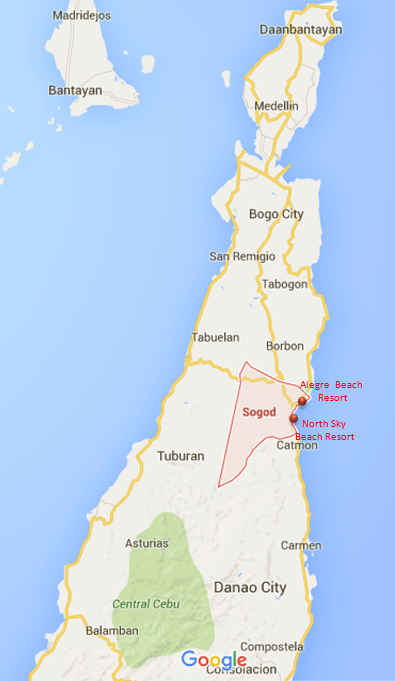 It would take roughly 1 hour and 30 minutes from Cebu City. There are two nearby beautiful beaches. One is the North Sky Beach Resort and the other one is Alegre Beach Resort. This place is great for family bondings, school renuions and any gathering. What I like about the place is that, they have good cottages with good landscape. Cottages design are nice, pathways and sidescape are beautifully designed. Welcome to North Sky Beach Resort! They have swimming pool but just small one. In my estimate, it would take 15 people or less to do swimming at same time in the pool. Alternatively, at the back, there’s gated way going to seaside. That time when we visited there, it was cloudy with occasional rain, so perhaps the reason why the seafloor isn’t much that we’ve expected like fine sand and sea water isn’t clear blue.. but landscape is superb!